So this is my first year to participate in StitchinSanta. Sheila, our benevolent #SSElf from “across the pond” at sewchet.com , has arranged this and manages all the participants. It goes like this: You sign up by a given date, usually in October, and give Sheila your name and address. She matches you up with a geographically close neighbor (she tries for the same country) and you become the secret StitchinSanta for another stitching friend! The gift limit is $15 US including shipping, but you can add in all the homemade goodies or extras from your stash you might have to make it extra special. You need to blog about it when you join, and then give a blog hint along the way. Then on Christmas morning, you should blog your StitchinSanta gift that you received. Too fun! I’ll admit that the biggest expense of my gift will be spent on shipping. See, I tend to buy in bulk and I hoard. I know those of you who read my blog are SO surprised to hear this! So everything in my gift will be brand new in the original packaging, except for one hand made item. Here’s a sneak peak at my gift. I hope she likes it! Honestly, I think there’s as much fun in giving as there is in getting. 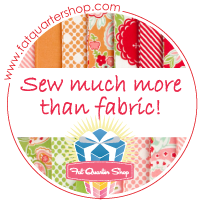 I’ve even had another participant from California contact me to ask about appropriate gifts for a quilter. So already I’ve made a new #StitchinFriend that I didn’t know before! How cool is that?? I love this! Hi Jen!! Gorgeous weddings! There is definitely more fun in giving – I LOVE to see all the reveals after Christmas! Don’t you dare go near the computer on Christmas Day to do your blog post though!